Putting down those thoughts and experiences that impact us can be an important tool in personal growth and development. Journals don’t have to be limited to the “Dear diary” entries you make at your beside table. They can be used in courses you teach as well. 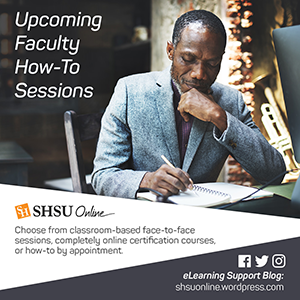 In online courses journals can be used as a mechanism for communication between a faculty member and a student, or as a reflective tool for students as they work to absorb what they are learning. Creative writing teachers can benefit from using a journal. Students can post their entries and instructors can make comments as needed. Journals can also be used to drive home what the student has studied over the week. Think about the reinforcement that happens when a student submits an assignment, discusses with his or her peers, takes a quiz and then puts it all together in a journal entry for the week. Finally, journals are ideally suited for formative assessment. Get the student’s temperature by asking them to write about their highs and lows as it relates to the course during the week. If something comes across that is legitimate, feel free to make course corrections for the benefit of all of your students. Here at SHSU we utilize the Blackboard LearnTM learning management system, which has a journal tool as part of it’s feature set. 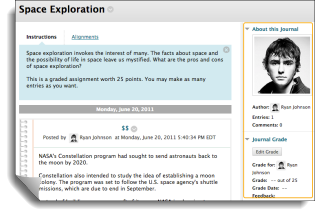 Journal assignments can be placed anywhere in the course and are accessible with click of the mouse. Learn more about implementing journals in your Blackboard course. While you are thinking of ways to ensure your students are getting what they need on their learning journey, consider reflecting on the added value of implementing journal activities to your courses.